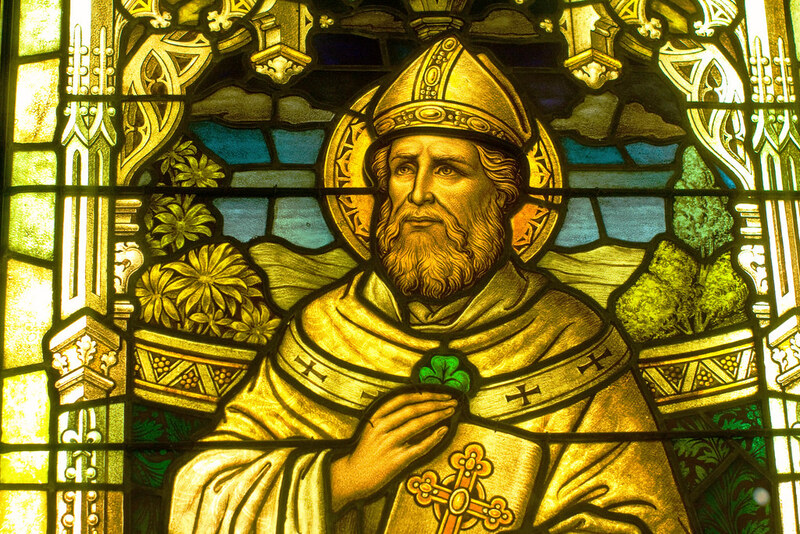 19 Facts About Saint Patrick–Some are Super Rare! 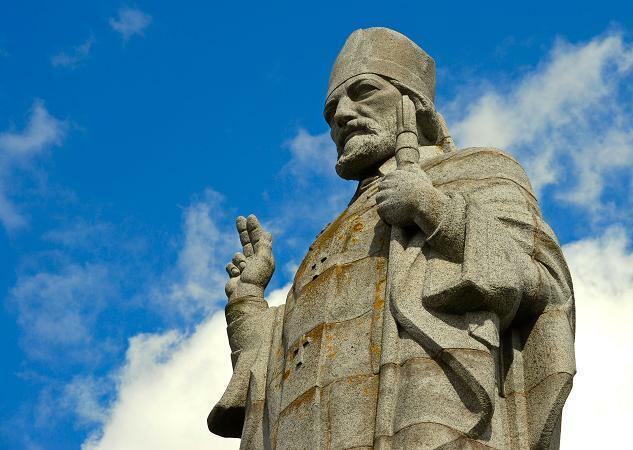 Saint Patrick’s day is celebrated with green wearing parade goers – but do you know these facts about the life of the Patron of Ireland? Although he’s the patron saint of Ireland and responsible for great conversions in the country, Saint Patrick wasn’t Irish. He was actually born in Roman Britain. 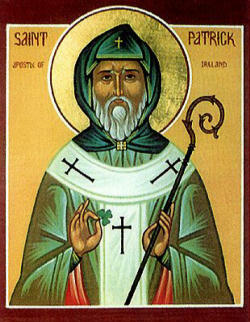 Captured from his home and pressed into slavery at age 16, Saint Patrick was a slave in Ireland. He spent his time herding sheep until his twenties, when he escaped. During his enslavement, Saint Patrick received a dream from God telling him how and when to escape back to his home. He was told to go to the coast, and there he found sailors who were on their way back to Britain – Saint Patrick’s home. 5. His name wasn’t always Patrick. Saint Patrick was born Maewyn Succat, and took the name ‘Patricius’ in his own writings. In Old Irish, this name translates to Patraic, which is Patrick in English. Before returning to Ireland, Saint Patrick studied in the seminary and was ordained a priest. He was ordained by St. Germanus, the Bishop of Auxerre. After studying in the seminary, Saint Patrick became a bishop. After his installment as bishop, he left to bring the word of God to Ireland. The exact details of Saint Patrick’s return to Ireland are unknown. The most common legend says that before spreading the Gospel, Saint Patrick met with the leader of the Druids, an ancient religion in the Irish tradition. The chieftain tried to kill Saint Patrick. Because he was a foreigner in Ireland, Saint Patrick endured many instances of persecution. He would not accept gifts from the kings of Ireland, so he was suspected of having ulterior motives for being in Ireland. In his Confessio, he writes that he was beaten, robbed of everything that he had and put in chains, questioning whether he was to be killed or not. In another situation, he was held in prison for sixty days. The lack of snakes in Ireland is attributed to Saint Patrick, who was said to drive the snakes away when they attacked him as he fasted for forty days on a mountaintop. There are three Irish legends that say during Saint Patrick’s journey to Ireland, he carried a walking stick made of ash wood. One day while he was preaching, he put the walking staff into the ground. The word of God took so long to get through to the Irish people that by the time that Saint Patrick was ready to move to the next town, his walking stick had taken root and began to grow as a tree. Saint Patrick has two crosses associated with his name. The first is the cross pattée, which carries a more traditional association. The second cross, the saltire, traces its roots back to 1783 and the Order of Saint Patrick. There is a bell shrine in the National Museum of Ireland that is said to contain the relics of Saint Patrick. Legend says that sixty years after the death of Saint Patrick, relics were removed from his grave site to be used in the bell. The bell was first mentioned in a book in the year 552. 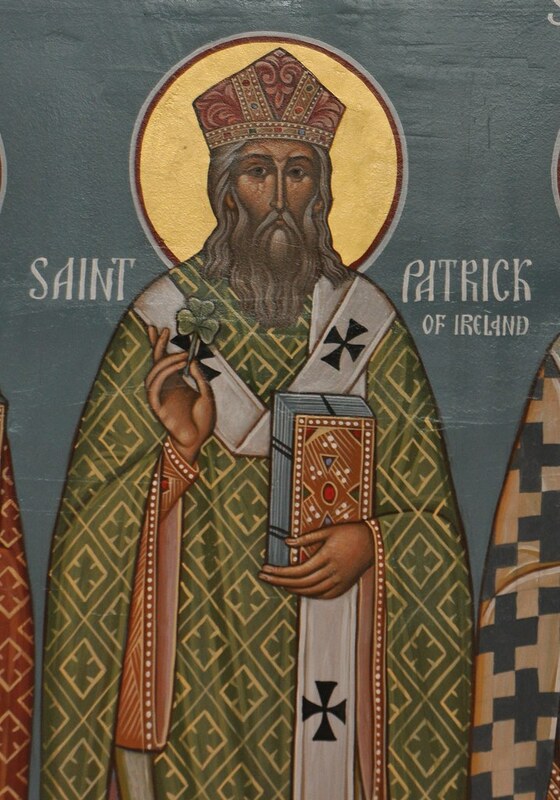 Saint Patrick spent the rest of his life in Ireland. He preached the Gospel and built Churches across the country. He died March 17, 461 in Saul – the city he had built his first church in. Although it has never been proven, it is said that the body of Saint Patrick is in the Down Cathedral in Downpatrick, Country Down alongside the bodies of Saint Brigid and Saint Columba. Saint Patrick used the three-leaf clover as a teaching tool during his missionary work in Ireland. He said that the three leaves of the clover represented the Father, Son and Holy Spirit. Yet even though they were separate leaves, each of them belonged to the same plant. This was the same as the three persons in one God that the Trinity is in the Christian faith. 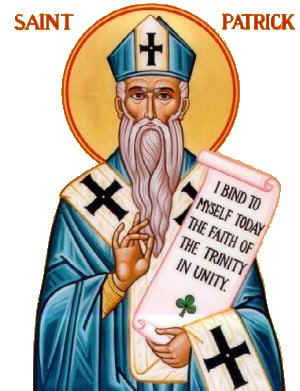 There are different colors of blue that are associated with Saint Patrick and his patronage over Ireland. In 1780, blue was the official color of the “Order of Saint Patrick.” Even though green is now associated with Saint Patrick and Saint Patrick’s Day celebrations, blue is still the official color of the state of Ireland, as well as the island.